“Circa” is a Latin word meaning “around, near, about the time of”. We use “circa” directly in English to mean “about the time of”, as well as in derivative words such as “circle” and “circus”. “Words With Friends” is a word game application that can be played on smartphones and other electronic devices. “Words With Friends” is basically Scrabble under a different name, or so I hear. The opening letter in the word “general” is a soft letter G (gee). We never used the word “gridiron” when I was growing up in Ireland (meaning a grill used for cooking food over an open fire). So, maybe I am excused for taking two decades as a US resident to work out that a football field gridiron is so called because the layout of yard lines over the field looks like a gridiron used in cooking! Our term “pique” meaning “fit of ill feeling” is a French word meaning “prick, sting, irritation”. At one point, the electronics and video game manufacturer Atari was the fastest growing company in US history. However, Atari never really recovered from the video game industry crash of 1983. A solar calendar is based on the 365 1/4 days it takes for the earth to orbit the sun. A lunar calendar is based on the moon’s phases, and has 12 lunar months of 29-30 days, with the “lunar year” ending eleven days earlier than the “solar year”. So, solar and lunar calendars are always out of sync. There is a device called an epact that adjusts the lunar calendar to bring it into sync with the solar calendar. St. Mary’s University is a Roman Catholic school in San Antonio, Texas. It was founded by the Society of Mary in 1852, making St. Mary’s the oldest Catholic university in the American Southwest. Elena Kagan was the Solicitor General of the United States from 2009 until 2010, when she replaced Justice John Paul Stevens on the US Supreme Court. That made Justice Kagan the first female US Solicitor General and the fourth female US Supreme Court justice. Kagan also served as the first female dean of Harvard Law School from 2003 to 2009. Port-au-Prince is the capital of Haiti. The city was hit by a devastating earthquake in January of 2010. The official government estimate of the death toll stands at 230,000 people, with many bodies never recovered. Giuseppe Verdi’s opera “Otello” was first performed in 1887 at La Scala Theater in Milan. The opera is based on Shakespeare’s play “Othello” and is considered by many to be Verdi’s greatest work. “Guffaw”, meaning “boisterous laugh”, is an imitative word that is Scottish in origin. The National Association of Securities Dealers (NASD) no longer exists per se. Since 2007, it’s functions are carried out by the Financial Industry Regulatory Authority (FINRA). These functions include regulation of trading in equities, bonds, futures and options. In 1971, the NASD set up a new computerized trading system called the NASD Automated Quotations stock market, a system we know better by the acronym NASDAQ. Hurricanes are given names primarily to help the public keep track of dangerous systems. The names are decided ahead of the hurricane season, with the first system given a name beginning with A, the second, B etc. The names are alternated between male and female names throughout the season. Also, if the first storm of the season is male, then the following year a female name is chosen. For hurricanes in the North Atlantic, names are assigned for every letter, except Q, U, X, Y and Z. The most frequently used name is Arlene, which was used for ten different storms from 1959 to 2011. There several species of fish known as angelfish. Each is brightly colored with a laterally compressed body. The Eiger is a mountain in the Bernese Alps in Switzerland. It is a noted peak for mountain climbing, with its treacherous north face being the most famous approach to the summit. Over sixty climbers have died since 1935 on that north face. “Poke” is an old term meaning “sack”. One wouldn’t want to buy “a pig in a poke”, i.e. in a sack and sight unseen. We’ve been using “mecca” to mean “a place one holds sacred” since the 1850s, and have since extended the usage to include any center of activity. The term derives from the sacred city of Islam, the birthplace of Muhammad. Country singer, actor and activist Willie Nelson was born during the Great Depression in Abbott, Texas. He wrote his first song at the age of seven and joined his first band at the age of ten, and he is still going strong. Nelson has a ranch in Texas but now spends most of his time in Maui, where he lives in a largely self-sustaining community alongside neighbors such as Kris Kristofferson, Woody Harrelson and Owen Wilson. As well as being an author, Italo Calvino was a famous Italian journalist. He was a supporter of communism and so wasn’t very popular in the US nor in Britain. Tarot cards have been around since the mid-1400s, and for centuries were simply used for entertainment as a game. It has only been since the late 1800s that the cards have been used by fortune tellers to predict the future. The list of tarot cards includes the Wheel of Fortune, the Hanged Man and the Lovers. “The Adventures of Huckleberry Finn” by Mark Twain was first published in 1884, not here in the US but rather in England. The original launch planned for the US had to be delayed until the following year because some rascal had defaced the plate for one of the illustrations, making an obscene joke. Once the problem was spotted a new plate had to be made, and 30,000 copies already printed had to be reworked to cover up the obscenity. “Apropos”, meaning “relevant, opportune”, comes into English directly from French, in which language “à propos” means “to the purpose”. Note that we use the term as one word (apropos), whereas the original French is two words (à propos). The phrase “in the style of” can be translated into “alla” in Italian and “à la” in French. “Riviera” is an Italian word meaning “coastline”. The term is often applied to a coastline that is sunny and popular with tourists. The term “the Riviera” is usually reserved for the French Riviera (the Mediterranean coastline in southeastern France), and the Italian Riviera (the Mediterranean coastline centered on Genoa). The large, central and dominant root grown by many plants is known as the taproot. In plants like the carrot and parsnip, the taproot is used by the plant as a storage organ. And, we humans (and rabbits!) like to eat that storage organ. The Kia Sedona is a minivan that is also sold as the Kia Carnival. 15 Cry while pointing a finger : LOOK! 11 “It’s clear now!” : I SEE! LAT: 6:57, no errors. WSJ: 7:06, no errors. Newsday: 7:04, no errors. @ Glenn. You are either up late or up early to get all those finished! Usually just do them around when they come out and have them done usually by 10pm or so. Whether I post about them here late at night or in the next morning depends on whether I happen to be awake or not. No errors. Sanremo (Liguria Province) is also the home of the Italian music festival in February, broadcast by RAI. Of course, we get that tv station. 18:40 no errors, NYT #0213 22:15 no errors . Good Wednesday for me. LAT: 7:06, no errors. Newsday: 4:52, no errors. WSJ: 7:08, no errors. 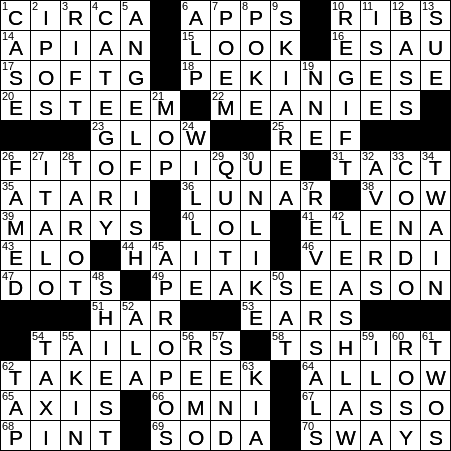 I had a good time with today’s puzzle – nothing out of the ordinary , except that I did not look for the central theme. Thank you Bill, for the root of pique … I use the word piquant often , as I eat hot food, which is normally at room temperature …. the synonym « irritant » seems to fit quite well ! Thank you also for the word ‘epact’ which is an adjustment between lunar and solar calendars … the Hindu calendar is a lunar- solar calendar so that certain festivals take place at the proper correct season and are not unduly displaced. Btw, today is Holi … in India , the festival where people spray or paint colored powders on each other. Happy Holi ! @Vidwan827 – Happy Holi! I recall the scene from the movie “Outsourced” in which the Holi day celebration took place. A good day to wear your “casual” clothes I imagine. Thanks for sharing. I finally saw it. But 100 is 100, no matter how you did it. @John Daigle – I love reading your posts! 8:29 and no errors. So far so good this week…. Vidwan! Wish I had known it was Holi today! I remember your posting about it last year, and I wore something colorful that day as a nod to the holiday. I’ve got to keep track for next year. Hi Carrie – Don’t know if you’ll ever see this reply (?) but that tv show was based on the movie of the same name. Check it out sometime. I imagine it’s on cable or maybe netflix or hulu or?